The Golf Club At Dove Mountain was designed by 18 time major winner Jack Nicklaus. The design of this Dove Mountain golf course integrates strategy, diversity and wonder into his Signature Course. The Golf Club at Dove Mountain is nestled into the lush Sonoran Desert at the top of the Dove Mountain foothills. 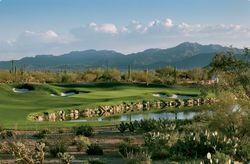 The twenty-seven hole course and 45,000 square foot clubhouse merge naturally into the saguaro covered foothills of the Tortolita Mountains. The Golf Club at Dove Mountain was unveiled in 2009. This outstanding Dove Mountain golf course was hosted the World Golf Championships Accenture Match Play and placed it on a worldwide stage. Start Your Search For A Dove Mountain Home – RIGHT HERE! This WGC tournament brings together the 64 top-ranked players in the world each February. This Dove Mountain resort destination golf course is layout with elevation changes from 2,300 to 3,000 feet. At this point, guests and members can enjoy the very same shots the pros must make. OK, not from the back tees. However, approach shots will involve similiar resourceful thinking and creativity of the professionals. The Golf Club at Dove Mountain has been created to be enjoyed by golfing legends and friends alike. The Golf Club at Dove Mountain is one of three of the finest golf communities in the Southwest. The other fine Dove Mountain golf courses include The Gallery Golf Club and The Highlands Golf Club. Each of these Dove Mountain golf courses offer outstanding amenities and legendary services. Members appreciate the casual luxury, superior service and lasting memories. This premier Dove Mountain resort in Tucson includes a golf shop featuring the leading equipment, clothing and accessories. There is an expansive practice area to hone every aspect of ones game. The elegant, yet understated, clubhouse reflects the true character of its picturesque desert setting. After golf, Cayton’s Burger Bistro beckens. Serving Gourmet Burgers, Shakes, signature entrees and an extensive selection of Regional Craft Beers. Cayton’s Burger is open to the public, members, and visitors. The casually elegant ambiance of the clubhouse is the ideal place for a tasty meal on the expansive patio at Cayton’s. The Golf Club at Dove Mountain at Dove Mountain Arizona is an elite place to be treasured by golfing legends and good friends.